Flushing the Banana River using the existing Lock system. A temporary solution to help the Indian River Lagoon Banana River section or just adding to the misery and destruction of the nations most diverse ecosystem? Confronted by the ecological disaster of ongoing algae blooms and the largest fish kills since the great freeze of 1895 many residents of Brevard County are advocating the easy and least painful solution of CPR for the dying Indian River Lagoon: Opening the locks at Port Canaveral and flushing the Banana River with salt water from the Atlantic Ocean. 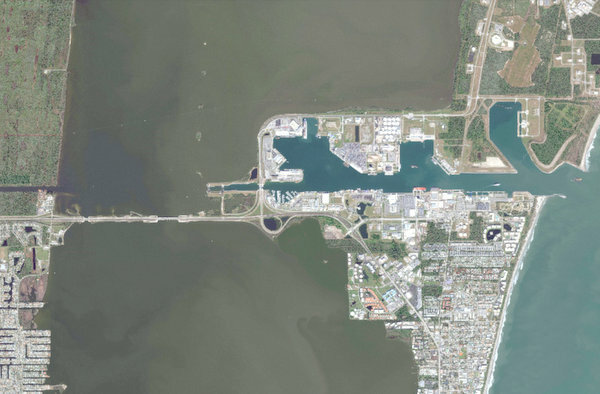 There are also advocates who wish to reconstruct the Port Canaveral locks so there is a permanent water exchange much like the high tide/low tide current water exchange at Sebastian Inlet. While I would agree that opening the locks is better than doing nothing for the dying lagoon and have read the study that explained opening the locks would not be very effective due to the distance of the lock from the ocean. 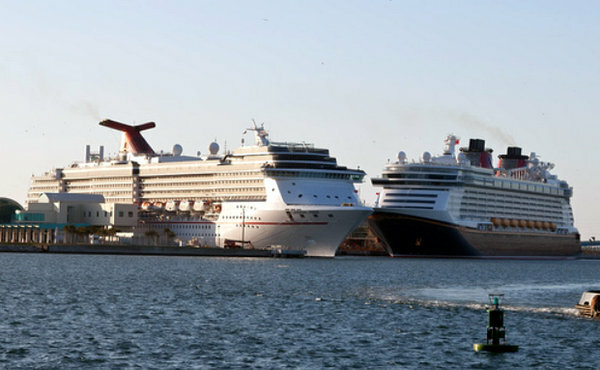 Great photo of Port Canaveral. 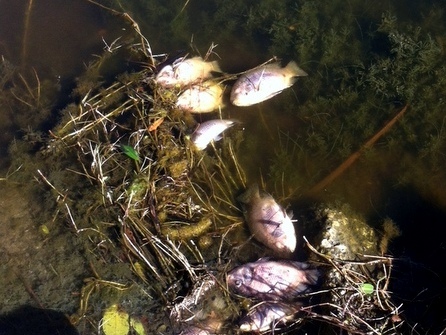 The deadly algae Bloom roils in the Banana River, -stark contrast to the blue saltwater of the Atlantic. Flush or not to Flush? I still maintain that opening the locks to the ocean is akin to placing a bandaid to a terminal cancer. This proposal does nothing to stop the underlying cause of the deadly algae blooms: yard fertilizer. The lock solution is the lazy person's solution to saving the lagoon and allows people to continue to poison the Indian River Lagoon in their personal quest for the emerald green yard. However there is another issue with this 'band aid' flushing solution: Just how clean is the water of Port Canaveral? Ever look at the water around any boat ramp anywhere on the planet and you observe the multi-color sheen on the water? If someone was to immerse oneself in the polluted waters of any boat ramp the person would emerge from the water smelling as if they had taken a gasoline bath. A baptism of stinging filth. And filth is just the point of a wide pyramid of filth and pollution. Port Canaveral has a very busy public boat ramp and at least two private marina boat ramps. (They are as clean as the state and federal government cares to enforce pollution standards.-not great but far better than no standards) And the rest of the pollution pyramid? Add in the fishing charter boats, the Coast Guard boats, the behemoth cruise ships that hold up to 4000 customers and the associated cruise ship tug boats, the ships for the salt dock, the concrete dock, the casino ship and the citrus ship, the cable ship on the Naval Side of the port and the submarines at the Trident Basin. Disclaimer I am not against any of those business or organizations or the United States Navy. Only pointing out the probable oil/gas discharges and associated dumping of human waste products and garbage. Of a minor note, the garbage that gets tossed into the water at the Jetty Park Pier and Port Canaveral food eateries. And let's not forget the two giant cranes that grace the western skyline of Port Canaveral -The two giant cranes that represent a future of cargo shipping from the expansion of the Panama Canal and proposed railroad bridge to the port. The potential pollution of the Banana River and Indian River Lagoon from Port Canaveral actually might very well represent a serious threat to IRL instead of being the quick savior to the Banana River section of the IRL. Even giving weight to closing the port lock permanently as it does for representing a possible saving solution. Especially in light of the fact that the "No Motor Zone" of the northern Banana River between Kennedy Space Center and Cape Canaveral Air Force Station if actually the cleanest and least developed section of the entire 150 mile long Indian River Lagoon. In closing, again the only real and permanent solution for rescuing the IRL is a complete ban on the sale and use fertilizers in Brevard County and the southern counties along the lagoon. Seriously no half way measures are acceptable for a River that is in the agony of a slow and entirely preventable death. Ban the fertilizers and pesticides NOW! Return Home from The Royal Flush Port Canaveral Problem.